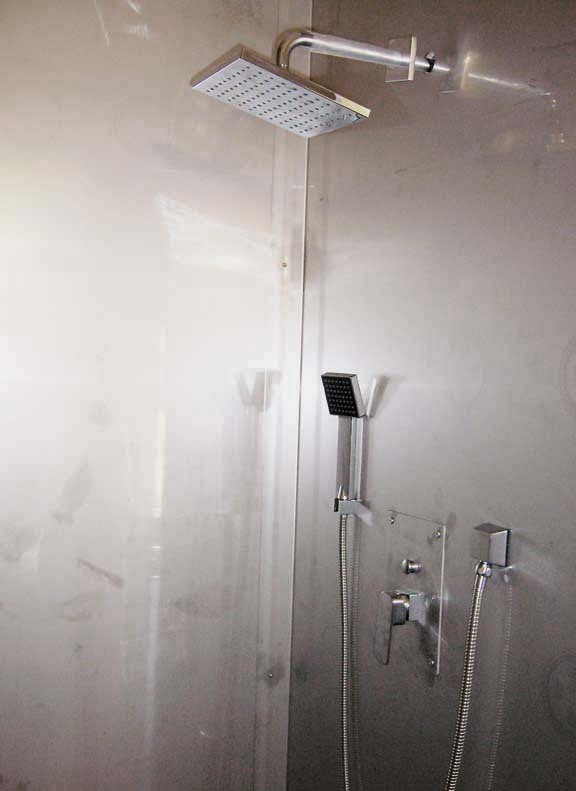 This entry was posted in Bathroom Remodel, Stainless Steel Shower and tagged building project, construction, DIY, house construction, shower, stainless steel shower. Bookmark the permalink. Thanks for this blog and advice. I found it while searching how to D.I.Y. 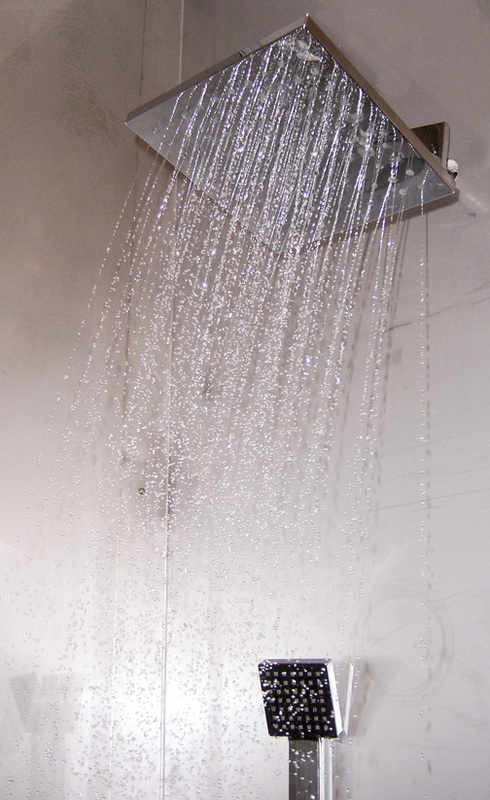 a stainless steel shower. We are both pretty handy, and my bf is a trained carpenter. We are just hung up on the drain ‘dimple’. Is this just an indentation around the hole for the plug to sit in? I want to know exactly what to tell our metal guys. Thanks so much. Glad you found my post! I couldn’t find much of anything about building these when I needed help, so was happy to share what I learned. As for the dimple, as written, “This was because the only shower drains I could find, locally and online, were for tile application. They set up higher than necessary for sheet metal. The dimple made it so the drain would set down low enough not to puddle.” So my suggestion is to buy your drain and give it to your fabricator so he can customize the hole. You’ve probably seen how some showers have a small ring of standing water around the drain after a shower, that’s the problem. I prefer that not to happen in our shower. Hi, how much did your fabricator charge you for material and labor? We are renovating our 2006 New Horizon 5th wheel RV we just purchased. One of our projects projects will be a SS shower. We live in Oregon and should be able to find a fabricator in our area. Our shower is smaller than yours but a ball park price will give us an idea. Sorry for the delay – the material and labor was $1600, as mentioned in the article. Maybe you can hire Mid Valley Metals as well, their link is in the blog. Good luck! Now that you’ve lived with a bit, how has it been? Do you find it noisy? Anything you would do differently next time? Thanks! Thanks for the comment, Joel. I’m happy with the shower after living with it for over a year. It’s not noisy at all, and pretty easy to maintain, a LOT easier than tile. I do wish I had triple-checked my measurements for the fabricator for the base, as I was off just a bit for the drain and that required some finessing that should not have been needed. But it’s all good now. I would not recommend the “heavy duty” metal suction cup shelves, soap holders, etc. as they hold up for a while, then BAM. Down they go. Usually in the middle of the night. I installed a floor-to ceiling stainless steel pole with shelf units and that looks and works much better. Hi Dave, It’s tough to get a good photo in the small space, but I just posted a photo of the other side of the shower stall, it includes a shower caddy that I remodeled and put in the corner, works great. There is already a photo of the side with the fixtures. What details would you like to see? I’ll see if I have what you need here. First time home buyer…doing our first project… master bathroom remodel. I like modern and shiny. I thought it would be easy to find a solid, metallic shower base to go with the large shower wall tile we chose. We want to avoid the grout cleaning involved with tiled shower floors. I am surprised to see that stainless steel shower pans are so uncommon! I’m wondering why they aren’t popular? Does is scratch easy? Is it cold on your feet? Difficult to keep clean with soap scum? I’m not able to find any useful information online. I don’t think I have ever seen a stainless steel shower pan to match up with tile. You would have to have your’s manufactured. You will have to decide if you want the tile to go all the way to the floor of the pan or to land on a ledge before the pan floor level. Either way presents the same cleaning issues. The second choice is more expensive to make. What great information. We’ve just begun researching the idea of a stainless steel shower, or at the very least, a stainless shower pan, and we happen to live in Eugene. 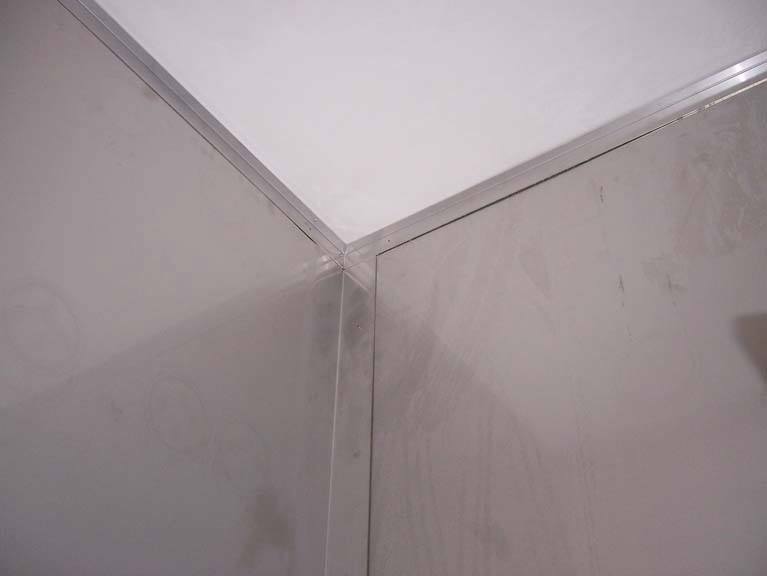 One question we have (and I surely may be back with more)is how are the joints of the wall panels caulked(made water-tight? Did you put any trim in the joints? Duh, I see the trim in the photos, that’s what I get for reading this out in the gorgeous sun. Would still appreciate knowing what you used to seal it up. I’m not sure what you mean by seal it up. All the joints are overlapped with no need to seal. Do you mean how it was fastened to walls? I haven’t been able to find the name of the “glue”/product that I used to fastened the stainless steel to the wall, but there are several caulk like products capable of bonding the two. Make sure everything is clean.